Hello and welcome to my blog!! I hope you have time for 2 posts today!! I have to apologize for not keeping up with you on your blogs or Facebook! My adult kids are still here and 2 more adults moved in for the month until their apartment is ready so it is really chaotic here at my home. I was stressing a bit with all the constant noise and demands so my husband finally took some time off this past weekend and we left for a quiet easy trip to the Black Hills in South Dakota. We have not been alone for a few years and we really needed it. The long weekend was so wonderful that I teared up when we left for home. lol Back to reality and I am struggling to catch up so please know that I think about you but may not be in touch like I should be right now! Let's get on with a new challenge at 7 Kids College Fund Challenge Blog! I would love it if you could come back later and to see my creation for the All Dressed Up Challenge Blog Hop. Here is my 7 Kids College Fund DT card that I am sharing with you today. "Windy Day" by Saturated Canary is colored in Copics with a bit of stickles added to her. I used Pion papers and distressed the edges and then inked the edges. The hearts are a die cut from Memory Box called Twirled Heart. When I first cut my hearts I saw the middle hearts stacked up on my cutting plate and thought what a great look for a future card too. So I think you get more uses out of this die cut. My friend gave me this handmade angel which I adore and she looks fabulous on the tag I made. Because I am selfish I am keeping the tag with the angel when this card is mailed out. lol The tag/envelope is from Melissa Frances and I chose a green envelope and then distressed around the edges of the tag. On the envelope is another Twisted Hearts die. My flowers are from WOC and Kort and Godt. I cut a small piece of Maja paper with the LaLa Land heart banner to adorn the bottom of the florals. Here is what the tag looks like when it is pulled out of the green envelope. Here is the inside, all I needed was the paper from Pion, so divine! I hope you pop over to our challenge blog and enter to win the grand prize gift certificate from 7 Kids College Fund Store! It is very easy to enter, just use something available from the 7 Kids College Fund Store and the theme is Anything Goes at 7 Kids College Fund Challenge Blog. You are so right about the Pion paper, it is divine! But then, so is your card, the Saturated Canary image is so, so beautiful and I love the angel - I would want to keep her too. OH! la la! la la! what can I say, besides I love all about this card! On top of it, you just gave me the link to follow for a project I am making, thank you Kelly, I will tell you more about it later, and I'll put the reference to you. On to your wonderful card, I love the happy look about it, I agree Pion paper have a charm of their own, they are unique... 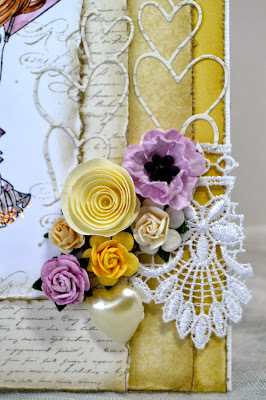 I have cramps whenever I cut through them... Love so much the idea of the little angel and the tag, the gorgeous hearts die cut, and the touch of yellow! Your card made me happy, I love nice summer breeze, and it reminds of this: the wind blowing on my cheeks and in my hair, softly.. Love your card. Good for you to take a break, yes back to reality, is not always easy. time flies! Have a lovley day Kelly. hugs. OMG.....love, love, love this card!!!!! Outstanding coloring, details, papers and that tag is absolutely priceless...don't blame you for keeping it!!!!! I think you are right Kelly, you have to keep this tag with the angel yourself. It is beautiful. Your card is is beautiful to, I am in love with the colorcombo, wow it is amazing. Again you did a great job with you card with stunning details. Outstanding Kelly! 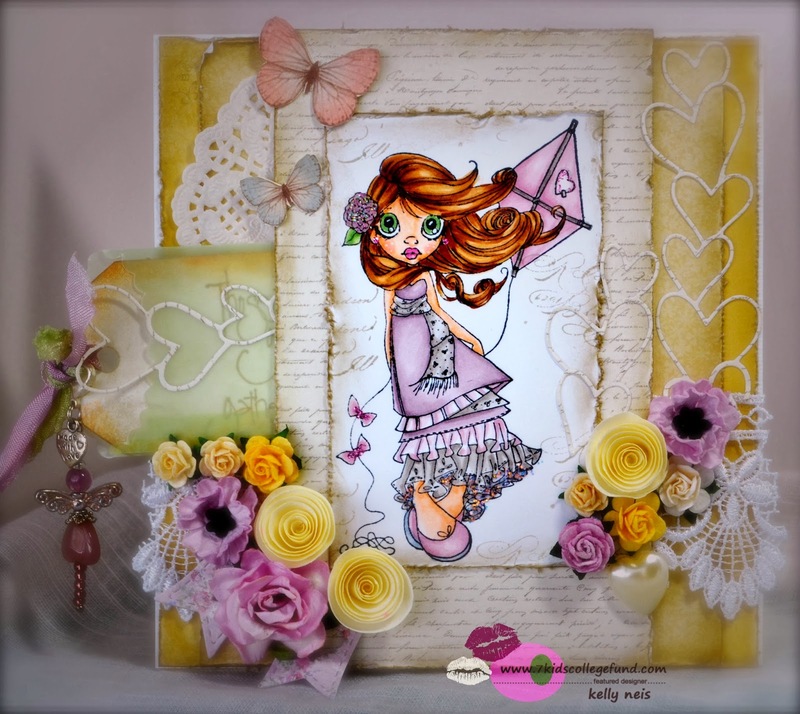 I love this card and your coloring is stunning! Gorgeous flowers and die cuts. All ingredients for a beautiful card! I love that tag too!! No wonder you don't want to part with it. I saw the pics on Facebook of your little get away. Wowzers it looks like you should of had some privacy there. Open fields and mountains in the background. Yummy! Enjoy the noise and confusion at home. It won't last forever. Kelly, you continually amaze me with all of your beautiful details on your projects! So glad that you had a wonderful time with your DH!!! Love this card! The colors and your coloring are spectacular. And I love all those flowers. Hey how did you get lips on your watermark? Ooooooo this is absolutely GORGEOUS!! Love all those extra's!!! WOZERS! Really bold colour contrast and somehow her auburn hair brings it all together - brilliant and beautiful. Such a fun card. I love how you colored that cute image. Her hair is spectacular!!!! What I don't know is how I miss so much and would have missed it completely had Danielle not had it on her blog. Lots going on here Kelly with some pretty neat colors. My favorite part - the beaded angel. She is very special indeed! Sorry I missed this Sugar Pie!